With a pronouncement as predictable as the blast of shotguns on the 'glorious twelfth', moorland owners have blamed the Government's right-to-roam laws for a spate of fires in England. The Moorland Association (MA), which represents the owners of much of England and Wales's prime grouse-shooting land, says allowing people to roam at will when the moors are dry presents risks. The anonymous spokeswoman for the Lancaster-based organisation told the BBC website: "There were risks opening up these vast tracks of moorland." Either the BBC reporter has cloth ears or Ms Spokeswoman doesn't know the difference between a track and a tract. Should get out more, grough says. She continued, possibly reading from page one of the Manual of the Bleeding Obvious: "We need to get the message out that it's not a good idea to be up on the moors when they're on fire." Unless you're a firefighter, that is. West Yorkshire fire service has been battling a blaze which has devastated 500 acres of the iconic Ilkley Moor since Wednesday last. The flames have been whipped up by strong winds and the media have been whipped up into a frenzy, with the Daily Telegraph spluttering that staggered moorland owners were calling at the weekend for a blanket suspension of the Countryside and Rights of Way (CRoW) Act access land, so despised of the toffs who want the moors to themselves to slaughter slow-moving birds in peace, broken only by the blast of the shotgun. The Act only allows access land to be closed when the fire risk reaches category five: 'exceptional'. 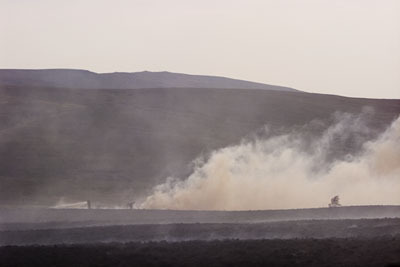 Martin Gillibrand, secretary of the MA, said: "The fact that moors burn like tinder before they get to an 'exceptional' level of risk indicates to me that the [Countryside] Agency has got the test wrong. At times like this the moors should be closed automatically." Presumably activities such as letting off firearms and littering moors with spent shotgun cartridges present no fire risk. A more sanguine Countryside Agency spokesman said in response to the Moorland Association hysteria: "Ilkley Moor has been open for hundreds of years. To say this has been caused by the CRoW Act is mixing the issues." While the moorland fires have undoubtedly been a disaster for much of the upland wildlife, experts say the heather environment will recover. Peter Riley, president of Wharfedale Naturalists, is quoted in the Yorkshire Post as saying: "I have great faith in the way that nature will bounce back, but it's most unfortunate." The Ilkley Moor fire may even have unforeseen advantages. Five weeks ago, grough reported the moor's owners Bradford Council was saying the moor risked no longer being a moor because of the encroachment of masses of bracken, much of which will have been destroyed in the fire and will be harder to re-establish than the heather, which is subject to periodical burning anyway as part of the land management system.